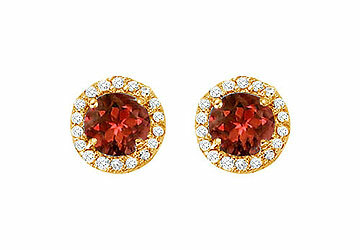 These stud earrings bear halo of 0.25 CT TW round brilliant-cut CZs around round garnets totaling 2 carats. 14kt yellow gold earrings. CZ weights are diamond equivalents. Perfect for January birthday and 2nd anniversary gifting. 2.25 CT TGW.